Call off the search, we've found the best cheap 4K TV deals from the latest sales in the UK on HDR 4K models. 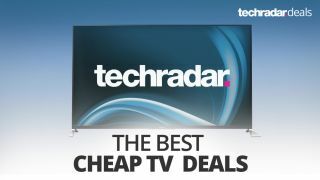 We've been super busy this week adding lots of highlights of the very best cheap TV sales. TV prices on some fantastic Ultra HD 4K TVs have been dropping nicely in recent months in the UK. We've got you covered if you're looking for TV deals in the US too. And with the bleak weather and long nights doggedly sticking around and your Netflix watch list getting longer and longer all the time you may as well settle down for the rest of winter and enjoy them with a lovely TV. Netflix, Amazon, Sky TV and the like are all increasing their 4K content too so you won't be short on Ultra HD content to watch. Note: all of our selected TV sales highlights are for 4K/Ultra HD TVs and include a built-in freeview tuner as standard. Pretty much every deal comes with Smart TV functionality built-in along with HDR technology. If they don't, we'll clearly mention it. Curved TVs are much more affordable nowadays and here's the proof. This 49-inch Samsung 4K TV is available for well under the previous £579. An excellent price for even a regular 49-inch Samsung screen, but you've gotta love those curves here. Save £300 today. LG seems to have wandered into the cheap seats today as this is a mega low price for an LG of this size. Not that we're complaining, especially as it's a still quite new 2018 model. John Lewis has a very similar model with a crescent stand and a five year guarantee for a bit more at £309. Save £350 today. This 2018 LG model has come a long way in a short time since its original £699 price tag. It really is a steal for a 49-inch smart TV of this calibre. And as you can see, it's not that much more than similar 43-inch LG TVs this week, so you may as well treat yourself to the bigger version. 49-inch TV deals are in good form this week and don't cost much more than the smaller 43-inch ones at all. If you're sat quite far from your TV, we'd consider starting your search at this size or above to be honest and when prices are this low there's no reason to suffer small screen sadness. Who would have thought that you'd be able to find a 4K 49-inch Samsung TV for under £400? That's the advantage of UK pricing being super competitive right now. This TV deal pulls no punches either with a 4K HDR screen with a suite of built-in smart apps. Want to dive into the colourful world of Ambilight TVs for less? Well today's a great opportunity as AO.com has knocked £100 off the RRP of this 43-inch model. Ambilight screens emit coloured light that matches the TV's content from the sides onto nearby surfaces for a unique viewing experience we can't get enough of. If you want a decent sized picture but don't want to dedicate a whole wall to your TV, this Sony Bravia smart screen is a good choice - and a great price. It packs the same tech as larger sets, including Sony's excellent 4K upscaling and Google Assistant. We were originally eyeing up the 50-inch version of this cheap 4K TV for a mention on this page, then curiosity got the better of us and we discovered this 55-inch upgrade is a mere £20 more. £349 is super cheap for a TV deal of this size, especially with a 10-bit HDR panel. £50 cheaper this week. This is a fantastic week for cheap TV sales in the 50-inch category and this 4K HDR model is making a strong argument for the best of the lot. What makes this one stand out from the similar Argos TV deals you ask? How about a reassuring two-year warranty? If you want a 50-inch 4K TV from Samsung then you'll have to pay a little more for the privilege, but not an awful lot more to be honest this week. Plus it is one of the best brands in TVs right now. Had your eye on picking up a cheap LG TV deal for a while? Well this is the best we've seen for some time as it comes with a mammoth 55-inch screen for a tiny £399 pricetag. Currys has knocked £100 off this one, but such a price cut can't last for long on a HDR10 panel of this size. We do love seeing quality 55-inch TV deals coming in way under £500 and this one from Hisense is a real sale highlight. If You'd prefer a slightly more recognisable brand, you're in luck this week as there are some 55-inch Samsung and Philips models below for not much more money. Save £100 today. 58-inch 4K TV deals are a rare size to find nowadays, but we'd welcome this into our homes at this price for sure thanks to the hefty discount from Currys. It's not just the large HDR10-enabled screen that caught our eye, but there's a two-year guarantee too. That's a stunning price, especially given this is the 2018 model which cost over £700 less than a year ago. You're getting the most recent version of Samung's excellent Smart Hub, which will run your streaming apps like a dream. Dynamic Crystal Colour and HDR 10+ will be a fine match for modern gamers too. Save £100 today. You've got plenty of options for Ambilight TVs this week if you want to add some extra colour to your living room. This is a great price for a larger 55-inch model. Watch in awe as coloured lights shine from the edges of your screen filling the nearby walls with colours to match the on-screen action. This 4K TV deal is £100 cheaper today. Surprisingly for a 65-inch TV at such a low price you're also getting an HDR panel. So it's well worth considering, especially if you're going to be gaming with the latest Xbox One X or PS4 Pro consoles. Plus select content from Netflix and Amazon will really pop with the extra colour range HDR offers. LG TVs are amongst the best out there and that often keeps the prices high. Not today though as this HDR10 4K smart TV with a huge 65-inch screen is available for just £599. Considering this was £1399 not so long ago, that's one hell of a deal. Hisense is another strong contender for your cash this week if you're after a large-screen TV deal. This really is amazing value for a 4K TV deal of this size. You're still getting a 60Hz HDR panel too instead of the 50Hz non-HDR ones we sometimes see on the cheaper end of the scale. Currys has knocked £130 off this popular TV with a strong 4.5/5 rating from buyers. £599 really is a strong price for a LG TV of this size, especially given the ThinQ AI and TruMotion 100 screen for a super smooth picture. While not an Ambilight TV, this is still an excellent TV from Philips. And look at that price! £649 for a 65-inch TV is a great find, especially with a HDR10 panel. As is increasingly becoming the standard with Philips TVs too, you get a two-year manufacturer's warranty. Samsung TVs cost a bit more than the competition, but the quality they offer is undeniable. What's really caught our eye with this 4K TV deal though is the generous five-year guarantee offered by John Lewis for added peace of mind. Well, looks we have a winner for the cheapest 75-inch 4K TV deal this week and it's left the next best deals from Samsung and Sony for dead at this astonishingly low price. Amazing value considering you're getting TruMotion tech and Google Assistant built in to this gorgeous HDR10 4K screen. We do love how big the discounts on massive tellies get when they eventually come around. Amazon has just knocked £905 off this epic 75-inch Samsung TV. Stock surely can't last long at this price. Currys has added a fantastic five year guarantee on this enormous TV. It's a whole lot of screen, and has Google Assistant built in. Better yet, it's £400 cheaper today than a few weeks ago. Now £200 cheaper than last month. Currys has just knocked a huge amount off this gorgeous OLED TV model. OLED TV prices are considerably more expensive than regular LED 4K TV deals for sure, but they offer the best screens in the business. So if you want the best possible category of TV for 4K and HDR, then OLED's the way to go. Sometimes 75-inches isn't enough. You're forking out a few thousand pounds for this Sony Bravia television and while it doesn't have the best contrast or HDR out there, if you're after a super-sized television, you could do worse than this £1000 saving. Includes a five-year guarantee.